As many of you also know, my birthday is in March, and the day after will be the six-year anniversary of the day I was diagnosed with stage III breast cancer at the age of 32. While six years feels like a lifetime ago now, at the time, I was beginning my sprint through 19 months of chemo, a bilateral mastectomy with reconstruction, and six weeks of radiation. Days like birthdays and “cancer-versaries” are powerful milestones in the life of most cancer survivors, and I’m no exception. Especially since in August 2016, we discovered that my disease had recurred and spread to my bones, and I was diagnosed with metastatic breast cancer. I began treatment again shortly thereafter and will remain in treatment for the rest of my fight. Truthfully, the last 19 months since my second diagnosis have not been easy; in fact, they have been some of the most difficult of my life. Everyone’s journey is unique, and I won’t pretend here to have any profound insights or answers. Many of the folks we meet through our work at Komen are walking through similarly difficult seasons — maybe some of you reading this right now are trudging through tough times yourselves — but one thing I’ve learned for sure is that life is not always fair. No one ever promised it would be, and many of us have known very real suffering because of it, some much more than others. I am certainly not the first to reflect on this next thought; in fact, I wonder if this truth is as old as time. Just as pain and joy seem to be inextricably linked, so too are suffering and gratitude. For, if or when we can get there, the experience of gratitude is often the purest, most effective antidote to suffering. It’s the getting there that’s the hard part. Ergo, my 2018 “Cancer-versary” Resolution: I’m challenging myself to “365 days of Grateful.” The clock starts on my 365-day Gratitude Project this month, and if you are so inclined, I invite you to join me. Some folks have sought to achieve this through a gratitude journal, prayer diary, ‘thank you’ notes, or mindful meditation – again, I’m not the first! 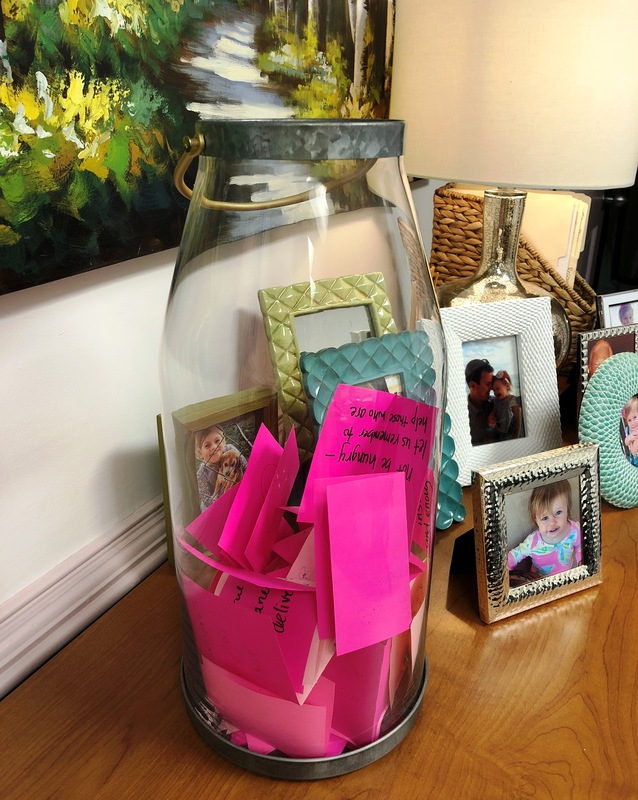 But I’ve chosen to embark on my journey using cut pieces of aptly-selected pink paper, a sharpie, and an oversized glass vase (shout-out to my sweet soul-sister Joanna Gaines’s fabulous Hearth & Hand collection). So here goes! Every day, I will write something (or maybe several things) for which I am grateful that day. It might be as deep and meaningful as being thankful for my loving family and supportive friends. Or a warm bed and healthy food to eat. A sunny Sunday. Kitten kisses. The smell of a springtime shower. Or perhaps the greatest freedom and simplest of all pleasures – the peace of being present in a moment. Yes, my dear Janna, toilet paper absolutely counts – Lord knows, we would miss it when we need it! – so if that’s what any of you are feeling today, toilet paper will do! To be honest – and I say this because I’ve been there – there is nothing more infuriating when you are truly in the depths of suffering than for a well-meaning friend to tell you to focus on and be grateful for all the good things in your life. Sometimes the loss(es) and grief are simply looming too large, and the well-meaning sentiment isn’t helpful. It’s just not where we are yet. But if or when we can get there, a precious moment of gratitude may prove a welcome balm for the pain. So dear friends, will you join me? Is there something you are grateful for today? So much of our suffering lies either in anxiety about the past or worry about the future. Shall we take a moment to be present and experience the blessing of being grateful? Perhaps you have a gratitude story you would like to share – send us an email or post on Facebook! We would love to hear your stories of trial, triumph, and choosing a grateful heart. ⇐ Have you or someone you know been diagnosed with breast cancer?